Each of the five Formula One cars suspended from this 35-metre-high installation by Gerry Judah are intended to represent key moments in the career of race-car driver Bernie Ecclestone. 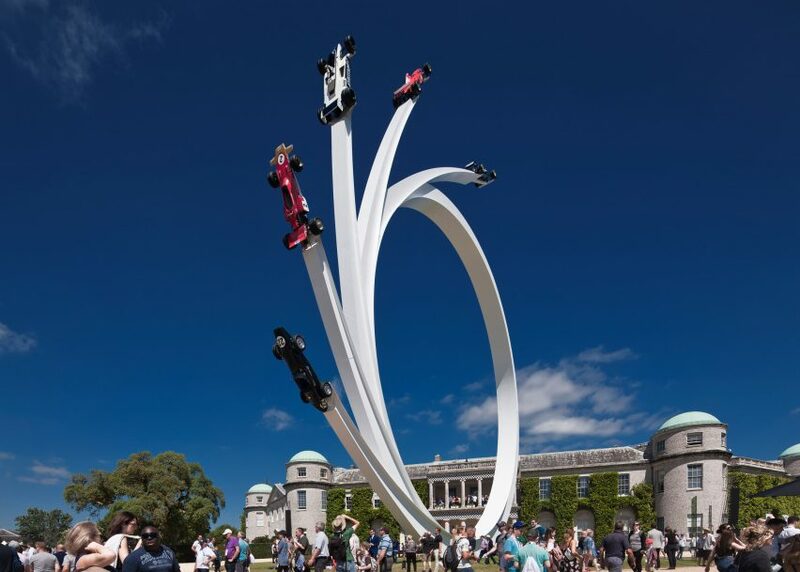 Designed by British artist and designer Gerry Judah, the sculpture was presented at the Goodwood Festival of Speed, which took place over the weekend. Judah has been commissioned to create a new Central Feature sculpture at the festival each year since 1999. He based 2017's iteration on former race-car driver and ex-Formula 1 chairman Bernie Ecclestone. Each of the five cars on the huge looping structure, which Judah says together are worth "millions of pounds", are linked to different points in Ecclestone's career. "Each car has a link to a different aspect of Bernie Ecclestone's career, such as the Connaught, for which he was entered as driver in two F1 races in the 1958 season, and the championship-winning Brabham, from the period when he was Brabham team owner," said Judah. "The other cars in this year's Central Feature are a Lotus, Ferrari and Mercedes, reflecting his time in Formula 1 management, which culminated as F1 chief executive." As with Judah's previous works for Goodwood, the sculpture towers above festival goers – measuring 35 metres tall and weighing 65 tonnes. The pieces of white steel have been welded together, and the entire structure took six weeks to fabricate and install. Last year, Judah's sculpture was made up of six giant steel spikes, while his 2015 structure presented a pair of Mazda race cars on a twisting track based on the form of a letter opener designed by Enzo Mari in 1962. 2014 saw the British artist create an arcing sculpture that curved over Goodwood House, with a pair of Mercedez-Benz race cars positioned to appear as if hurtling past each other. In previous years he has created giant knotted sculpture, and a bright red looping structure that referenced the Alfa Romeo cloverleaf badge. The designer was also commissioned by Porsche in 2015 to create a soaring steel sculpture for its Stuttgart museum. This year's Goodwood Festival of Speed took place from 29 June to 3 July 2017 in West Sussex, England.